The most common cause of tongue swelling is an allergic reaction to something. And the FASTER the swelling comes up, the more serious the allergy. If it swells up within minutes or less than an hour, it is potentially life-threatening. Head to the nearest hospital emergency department. This can be VERY SERIOUS. Please don't delay. If your tongue has started swelling, and has increased in size rapidly, just get yourself to the Emergency Room. But an enlarged tongue that has developed over a longer period of time (a day or longer) is less likely to have a serious cause. The most serious allergic reaction which can cause a rapid tongue swelling is called anaphylaxis, or anaphylactic shock. A blue coloration to the lips, earlobes or fingernails. Becoming unresponsive or passing out (ie. fainting). A tight feeling in the throat. General swelling or puffiness around the eyes and lips. The person may become very distressed. Breathing problems, being short of breath or difficulty with breathing. What allergies can result in anaphylaxis? Almost any type of allergy can lead to anaphylaxis, if the person is sensitive enough to the thing that causes the allergy. A relatively common one is to Penicillin. Most people are familiar with food allergies such as peanut allergies. Although these can be serious, it's not very common to get a full-blown anaphylactic reaction from a food allergy. It CAN happen, but it's RARE. However, a rapidly enlarged tongue can still occur, and be quite frightening. The danger here is that a swollen tongue may block the airway. The quickest treatment is a small dose of adrenalin - usually by injection. A rapid tongue swelling from an allergy is most likely to be caused by an allergy to something other than food, most likely a particular medicine, or from an insect bite or snake bite. In fact, allergies to medicines of one sort or another are probably the commonest cause. In dentistry, a surprising number of my patients have an allergy to latex, which means that I have to switch to latex-free gloves. 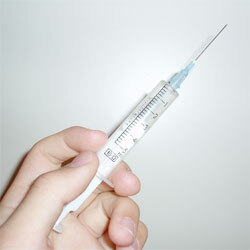 Sometimes, people with a known severe allergy will carry an adenalin injection around with them. (for example, an "EpiPen"). If they happen to experience the first symptoms of an anaphylactic reaction, they can administer the adrenalin themselves within 10 seconds. There are also many other causes of tongue swelling or an enlarged tongue. These are generally less rapid to develop. Acromegaly. This is a hormone disorder that results in enlarged skull, hands and feet, as well as causing other complications. Amyloidosis. An enlarged tongue is a typical symptom of this serious disorder, but it is the least of the problems involved. A diagnosis of amyloidosis is made by biopsy, not by having an enlarged tongue. Downs syndrome. Sufferers typically have a larger than normal tongue. This is not significant at all.The tongue may gradually become wider in persons who have no natural teeth and do not wear dentures. Trauma - biting the tongue while eating, or in an accident like a car smash. This is like accidentally hitting your thumb with a hammer - some of the swelling is due to inflammation, and some of the swelling is from ruptured blood vessels, causing a severe bruise or haemangioma. Burning Tongue Syndrome. Some people who suffer from burning tongue syndrome also feel that they have an enlarged tongue. Cancer of the tongue. Usually there is no tongue swelling in the early stages of tongue cancer, so DO NOT allow a LACK of swelling to convince you that there's nothing wrong. Check out cancer of the tongue for things to watch out for. Infection. This isn't very common as a genuine cause of an enlarged tongue. It's usually a case of the tongue being so uncomfortable that it feels enlarged. It may well be slightly swollen, but only slightly. It feels much worse than it actually is. You can read more about this at my page on tongue infections. Leukemia. A swollen tongue is only one of the symptoms of leukaemia, and it doesn't always occur. Like with amyloidosis, it's the least of your worries. You can get a tongue swelling when you have a vitamin deficiency, such as B12. This can be caused by a poor diet, or a digestive problem. As well as a moderately enlarged tongue, most sufferers are also plagued by mouth and tongue ulcers. There are also other, rarer, causes of tongue swelling. The general rule is always the same; if you notice something in your mouth is different or has changed over the last days or weeks, get it checked by a healthcare professional. Most things are harmless, and EASILY TREATED; but the important thing is to catch the serious conditions as early as possible.